Life After Theft is only 1.99 on Amazon & B&N as of today! My mind is officially blown. To set the record clean, I have never been a fan of books with ghosts in them. Only in books such as Harry Potter do I make an exception, and even then Nearly Headless Nick doesn't exactly play an essential part in the story, unlike the ghost, Kimberlee, in Life After Theft. So, needless to say, my expectation weren't incredibly high. And yet, I loved this book entirely too much. I even loved the ghost aspect. The first thing that I immediately noticed, was that this book was narrated by Jeff. This is refreshing as boys are rarely the main characters in the YA genre. Also, Pike writes in a boy's first person voice expertly. I applaud her for making Jeff so vivid, with a clear personality. He was so sweet and awesome! He is also funny and snarky, which is plus. The second thing I found refreshing was that Kimberlee, a kleptomaniac ghost. She wasn't a creepy "haunter" or a love interest, which I find is most often the case. No, she was a vibrant character. I also loved the way Pike handled Kimberlee's kleptomania. Other characters I enjoyed were Sera, Jeff's love interest. She was different. I'm not totally sure what I thought of her, but she had been through a lot. However, I was definitely rooting for her and Jeff to end up together. The plot, of course, was something I find genius. Who's the bad guy? Kimberlee for stealing? Jeff for returning the things, yet damaging property while doing it? The principal for trying to catch Jeff? Also, I loved how the plot(s) resolved. Especially the one with Kimberlee and the stealing, and Sera and "the secret". 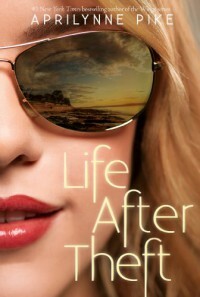 I found that Life After Theft was also a very addicting read. Every chance I got, I picked up my e-reader to to continue Jeff and Kimberlee's story. By the way, I loved how the author spelled Kimberlee's name. Sorry, that is off topic. Anyway, I found the pacing and length perfect. Another thing I always try to mention in reviews is the setting. I found the ridiculously posh high school a perfect setting for the characters. Overall, Life After Theft threw me onto a much needed rollercoaster. One with different twists and refreshing spirals. (I remembered something! Just the other day I noticed the roller coaster metaphors are common in reviews, blurbs, taglines etc. I should come up with a more original one for future reviews.) This original stand-alone is definitely reccomended. Also, stand-alones are rare, so I was delighted to find this one. Little Note: This is different than Pike's other novels. Thankfully, I already had some heads up from various reviews. I think having this knowledge made the reading experience better. Go in with no expectations!